3 levels of living space. Large fieldstone fireplace. Fully equipped, modern kitchen with dishwasher and microwave. Lots of glass to watch it snow! Fireplace with plenty of wood. 4 large bedrooms and 2.5 bathrooms. All bedrooms have a queen size bed. There is also a bunk bed, a day bed and futons. Wrap-around deck for lounging in the sun in the warmer weather. Located on town maintained road. Washer and dryer. Cable TV, VCR, 2 DVD players, 3 TVs. Linens are provided but a fee is charged. There is a game closet full of board games. This was the perfect place for our family and our friends to enjoy a long weekend away. The house is very comfortable to be in. There was room for the kids to play and the adults to hang out without everyone being on top of each other. The owners are great to work with. We will definitely look to stay here again in the future. We had a terrific time staying in the MacDonald home in West Dover. We were two families with four kids between us and the house was perfect for us. And it was very convenient to Mount Snow -- only a 15 minute drive away. The house had everything we needed; the satellite tv and internet worked flawlessly, and we would absolutely recommend this location again! House Itself: Perfect set up for groups or families. Kitchen is fully stocked. Lots of games. Large dining room table fit our group of 8 with room to spare. Windows in living room are huge and nice to look at falling snow outside. Plenty of space for everyone to spread out and a bonus room downstairs would be convenient if you have kids in your group. The wood burning stove was GREAT and added ambiance while keeping us warm. Cleanliness: The house has a lived in feel. This is NOT a spotless, professionally cleaned, brand new furniture type place like some rental homes are. There were a few pots that were somewhat dirty, the furniture is older, there are personal items on sideboards, and food in the fridge. For our group, this was great because none of us were picky and we liked not having to worry too much about an accidental spill or similar, but, I do have some friends/ family who would not have been happy with it. Not necessarily a bad thing but something you should be aware of. Location: The location is good - about 20 min drive to Mt. Snow and about same to Wilmington when considering snowy roads and some traffic. Plenty of restaurant and bar options within a 10-15 min drive in East Dover but nothing walking distance (as you can tell by the map location). Arrival/ Departure Process: very easy arrival process and casual departure policy. Owner and Value: owner was responsive after some confusion on booking that included a last minute rate increase. Because of the security deposit (which was returned almost immediately, very prompt) we booked through website instead of sending a check directly. Overall: I would stay here again in a heatbeat. It is not as conveniently located as some other options closer to the mountain but the house is so perfect for a casual ski trip that it is worth the extra drive time. Everyone in my group agreed. Thank you for your review. It should be noted that this home is not primarily rental property, but is our home away from home. As such we try to make it comfortable with minimal clutter. The furniture in the house is not new but it is in fine condition. The layout has been selected for comfort as opposed to a creating a showcase. The kitchen is fully stocked with many pots, pans, dishes etc. We do our best to insure that everything is clean prior to renting. We leave a few items in the refrigerator for the convenience of an arriving rental so that not every type of condiment or herb needs to be provided since all of our rentals are very short term. My family, along with my cousin and her family, rented this lovely, spacious ski home for five nights during Presidents' week. The description of the property accurately reflects this house. It consists of three floors of living space. All of the common areas and bedrooms are spacious. The home was neat and clean upon arrival. The fireplace was lit as we arrived during quite a cold spell! My children slept in the downstairs bedroom which consisted of bunk beds and one queen bed. That floor was also very toasty! There was plenty of hot water for everyone to shower after returning from the slopes. There are plenty of games, DVDs, and books if you get stuck indoors as we did. The kitchen is large and well equipped if you decide you want to cook or just congregate around the island for some apres ski snacks and drinks. The home is right off a main road and a close drive to Mount Snow. We spent an afternoon at North Star Pizza/Bowl for lunch and candlestick bowling. There are plenty of restaurants, delis, markets, nearby. Lastly, it was easy to unload and load up the car as the driveway led directly up to the door on the ground floor. 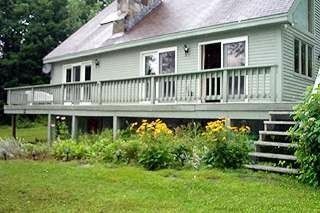 We would highly recommend this property to others who are looking for a great ski house near Mount Snow. Located near Mount Snow and Haystack ski areas ... only a ten minute drive to either area. 35 minutes to Stratton. Close to snowmobiling trails. Great for families, large living room with fieldstone fireplace. Shopping at Wilimington only 15 minutes. Great for Summer/ Fall getaways in a quiet and peacefull setting. 3 golf courses within a 10 minute drive. Horseback riding close by.